These small pieces can make a big impact. You never realize just how essential and versatile a console table—also known as a sofa table or entryway table—is until you add one to your home decor. Its names may sound specific to the purpose, but one of these tables works in your entryway, yes, but also hallways, bedrooms, living rooms—even in your office as a space-saving desk. Consoles work best when leveled against another element in your home, either a wall, bed or couch. They make a great place to display decorative items, stash your keys or even act as stylish and secretive extra storage space. We've searched high and low and rounded up 13 of our favorite ultra-stylish console tables that will work in any style home. West Elm has long been our favorite source for contemporary furniture where we'd happy spend our whole paycheck. 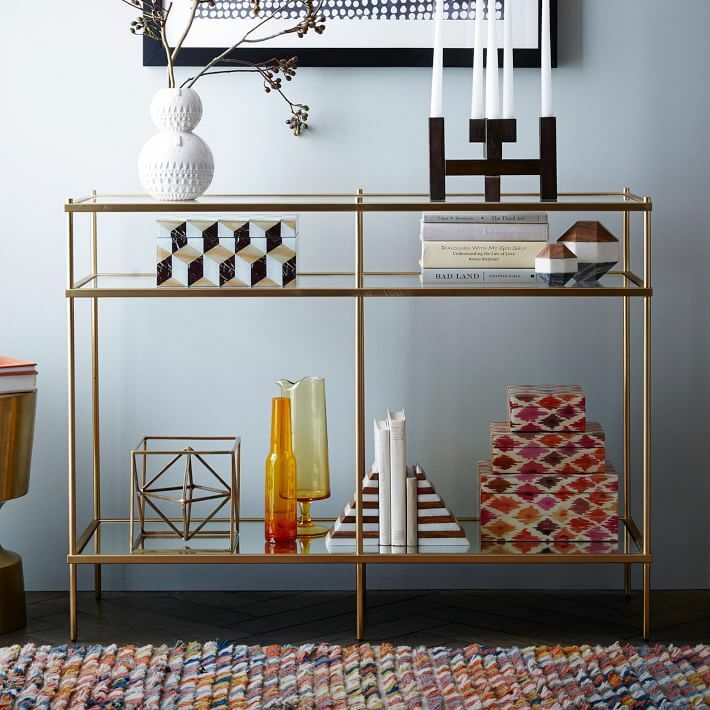 Case-in-point, this beautiful console table made from brass with glass shelves. Brass is a hot decor detail right now, but it will maintain a timeless appeal for years to come. Mirrored furniture has an innate ability to make any room feel more glamorous. This affordable option from Target has a second tier a few inches off the ground which makes it ideal for displaying art objects and coffee table books. What is it about this table that makes us think of a swinging pool party in Palm Springs in the 1960s? The lucite and gold hinges have a slightly mod feeling, but you can keep it contemporary with funky art pieces, books and frames. If your home as a more industrial feel, try an entry table with rough wood and iron features. This one maintains a sophisticated feel with its clean lines. Bonus: the table sits atop caster wheels, making it easy to move around the room when you get the urge to redecorate. A relatively simple design with clean, classic lines, this gold and marble console table would work in a variety of spaces in your home, but we happen to think it would make a great bar setup in a small space! We love the masculine, minimalist look of this console cabinet, which would work as well in a dining room as it would in your entryway. The mid-century look isn't going anywhere, so you can bet this statement-making piece will have appeal for seasons to come. This white console table would be a home-y, casual addition to any entryway. The barn door-style back wall and natural wood top give it that air of farmhouse charm, but a handsome piece like this—handcrafted of poplar—works in a more traditional home as well. This under $200 console table from Ikea in a soft grey gives us major farmhouse vibes—with a minimal, Swedish twist, of course. With glass panels on the top, this table invites you to put some of your knick-knacks and small objects on display—or at least make them easier to find. For a home with major modern design vibes, we'd splurge on this cool clear acrylic table from CB2. The simple design means you can create a whole vignette or entryway around it. Isn't it amazing how something you can see through simply can't be missed? Glossy, glam and maybe just a little bit over the top? We love how impactful the design on this Willa Arlo entry table is, with it's reflective silver and dramatic side detailing that makes us think of deco days gone by and The Great Gatsby. If you're looking for a console table with serious attitude but an elegant, sophisticated finish, this one from CB2 with a stitched leather form and legs capped in brass is just the thing. Serena and Lily have reimagined their signature coffee table as a stylish console that fits snugly anywhere you might put it. It looks both beachy and modern with it's hand wrapped raffia frame and sharp edges. Plus, with two levels of display options, this table (which would make a great vanity, by the way) has double the design potential! For something a bit more minimalist and modern, this simple console table we found from Wayfair (of course!) has a versatile and unfussy look we love. Work with the sleek lines and treat this table like a blank canvas–just about anything will look good around and on top of it!